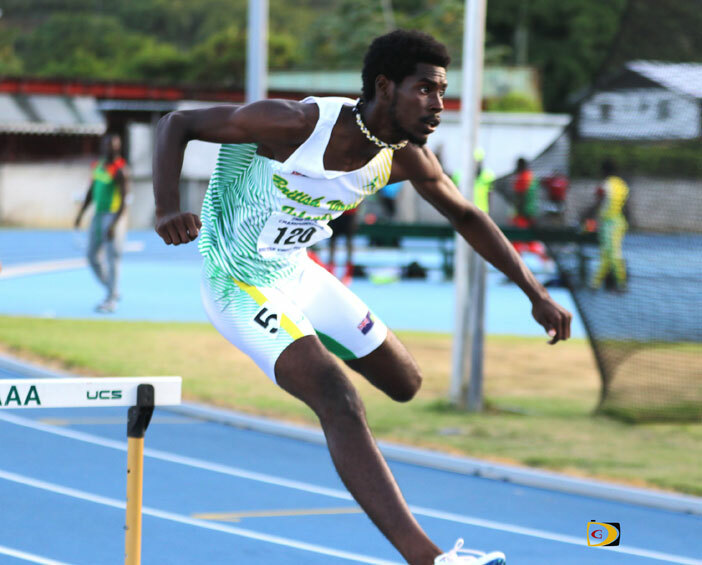 In his first race over the barriers since winning the International Association of Athletics Federations World Jr. Championships 400m Hurdles bronze medal in Poland last July, the BVI’s Kyron McMaster met his goal of qualifying for the August 4-13, IAAF Sr. World Championships in London, on Thursday. Chantel Malone of the BVI, also won the Long Jump. In his season debut, McMaster won the event at the Florida Gator Relays, with a time of 48.71 seconds to improve the 49.56 seconds national record he established last summer. McMaster’s time is also an OECS Record and as of Wednesday, was the No. 2 time in the world so far this season. McMaster who signed with the Florida Gators in November and will attend school beginning in August, said seeing the time at that moment didn’t surprise him, but in a sense it did. He said in training, he had been on point to run that exact time. After winning the Jr. College Indoor Championships 400m, McMaster, who joined St. Croix’s Allison Peter as the only Virgin Islands athletes to qualify for IAAF Word Youth, IAAF World Jr. and IAAF World Sr. Championships, was dropped by Central Arizona, when he got hurt and was unable to perform outdoors. Coming off that, he said he has been motivated. Leading the competition from her second attempt, a windy 6.49m effort on Friday, Malone had her best jump in her series of 6.57m (21 feet 6 inches) on her final attempt. Five other BVI athletes also saw action in the Florida Relays. Ashley Kelly ran her 200m heat with a time of 24.04 seconds, while Tahesia Harrigan-Scott was timed in 24.05 in hers and Karene King ran 24.16. Harrigan-Scott, Malone, Kelly and King combined to run the 4x100m Relay in 44.37 seconds to place third in their heat and ninth overall. St. Augustine Sr. Khari Herbert won his 400m heat in 47.09 seconds and was seventh overall. Rikkoi of IMG Academy, won his Boys High School heat in 10.72 seconds, running with a 2.2 meters per second tailwind. Competing in the Miami (Ohio) Duals, Findlay Jr. Tynelle Gumbs improved her week old Hammer Throw national record with a heave of 57.68m (189 feet 3 inches) to finish fourth. Twin sister Trevia improved her 49.51m best from a year ago, cracking 50m for the first time with her toss of 51.16m (167 feet 11 inches), finishing second in the group and 11th overall. Tynelle returned in the Discus with a mark of 44.67m and finished fifth. Trevia followed in sixth with 42.40m (139 feet 1 inch). Trevia bounced back from last week’s unlooked for 11.84m (38’10¼ inches), in the Shot Put with a season’s best throw of 14.10m (46 feet 3¼ inches) to finish fourth. Taylor Hill of South Plains College, had a wind aided time of 11.81 seconds in the Clyde Littlefield Texas Relays 100m where she placed third in her heat. Sequoias freshman Tarika “Tinkerbell” Moses, ran a 54.20 seconds 400m seasons best, to finish second at the Stanford Invitational, then contributed a strong second leg carry on the 1600m relay that won its heat in 3 minutes 44.96 seconds, to finish sixth overall. Her brother Tarique, a Central Arizona freshmen, ran a personal best of 1 minute 57.51 seconds to win his heat in the ACCAC Glendale meet 800m and was second overall. He also tied for sixth in the High Jump with a 1.80m clearance.